The Cross Party Group on Culture, hosted by Joan McAlpine MSP, invites you to the next group meeting. What are the barriers to working successfully as a Cultural Freelancer in Scotland? 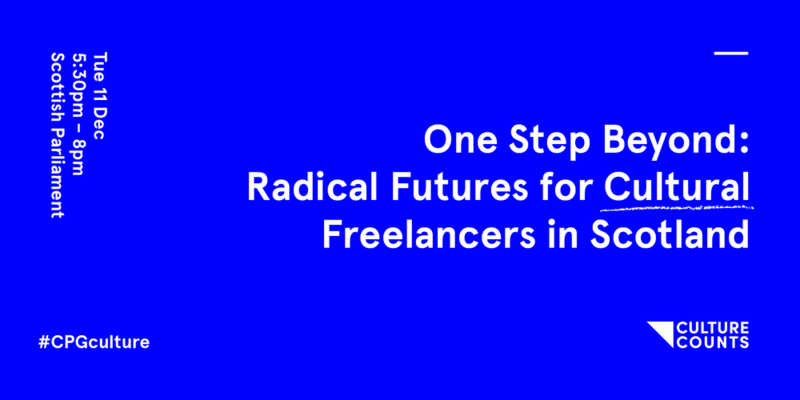 What changes can we make to better support freelancers? Use #CPGculture to follow and join in the discussion online. The Cross Party Group on Culture is open to all. If you haven't attended before; Cross-Party Groups (CPGs) provide an opportunity for Members of all parties, outside organisations and members of the public to meet and discuss a shared interest in a particular cause or subject. The cross party group on culture meets twice a year at the Scottish Parliament. The purpose of the group is to discuss cultural matters and ideas. Book your free tick using the box below or on Eventbrite. Sign up to the mailing list for dates of up and coming meetings. We respect your privacy. We use Mailchimp as our newsletter platform. By clicking below to subscribe, you acknowledge that your information will be transferred to Mailchimp for processing. Learn more about Mailchimp's privacy practices here. Culture Counts will use the information you provide on this form to be in touch with you about the Cross Party Group on Culture. Connection: Impact of the Referendum on EU Membership on Scotland's Cultural Sector.